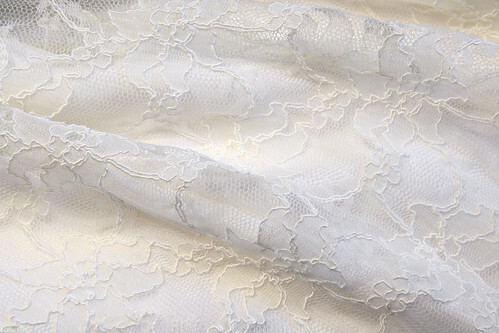 Lace is a key aspect of the wedding dress I am making for my friend Zoe as it covers the entire dress, sewn into the bodice but hanging as a separate layer for the full length skirt. We wanted an all-over lace with a large floral motif and a vintage feel, preferably in pale ivory to coordinate with the main fabric. I scoured the internet, high-street shops and wholesalers, discovering more about bridal lace than I ever thought possibe, but actually found very few specimens I liked enough to order samples. Most were either too glitzy or verged on net-curtain territory. Of those short-listed, some turned out to be a bad colour match, others didn’t have enough drape, had a 4 week ordering lead time from Paris or were just too expensive. All but two were over £45 /m. Although bi-directional, most were no more than 1 m wide. We’d have needed at least 4 m which would have blown the budget. I’d also have been terrified of messing up! Left to right: Viscose / nylon corded lace, £59 /m; fine French cotton corded lace, £46 + VAT /m trade; fine French cotton lace, £55 + VAT /m trade; Nylon corded lace, £20 /m; Heavy ivory and gold corded lace, £46 /m; James Hare fine corded Chantilly lace, ~£100 /m. The one we chose was the cheapest of the bunch at just £12.99 /m and 140 cm wide from good old John Lewis – a pretty, medium weight corded lace with good drape, and being 50% cotton, a lovely, soft feel. It is mid-ivory, so a bit darker than intended. Unlike pricier options, the edging is not attractive enough to be used on the dress, but the incredible price more than made up for it. I’m very happy with the way it looks on the final piece, definitely the right choice. I’ve been following the whole process through your tweets and posts and it has been very inspiring, nerve-wracking and educational. I’m looking forward to the big reveal!